​It has long been a tradition at the Palace Theatre, that following on from the excitement of the Christmas season, a good old thriller keep us all entertained during those long, dark, January evenings. 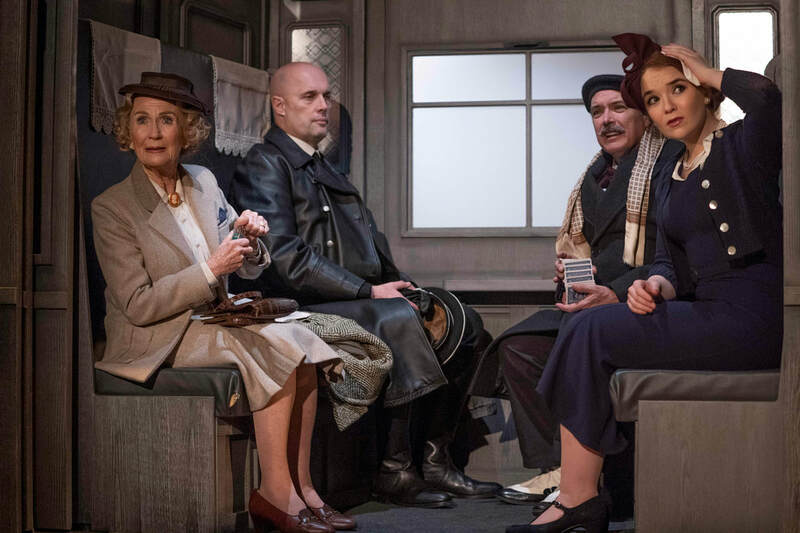 This week, a brand new screen-to-stage adaptation of Alfred Hitchcock's famous 1938 film, The Lady Vanishes has arrived in Southend, presented by Bill Kenwright and the Classic Thriller Theatre Company with an all-star cast, directed with great panache by Roy Marsden. The curtain rises on a railway station in Nazi-occupied Austria. An avalanche somewhere down the line has caused the passengers to be stranded for the night, and amid the chaos we are introduced to some of the passengers waiting to continue their journey, some to Switzerland, and some on their way home to London. Huge Nazi flags hang from the roof, and we are reminded that this play is set in dangerous times, and there is a certain amount of urgency to leave. These passengers include Lady Iris, (Lorna Fitzgerald) a young woman of high society, travelling home with her friend Blanche, (Natalie Law) who is being amorously pursued by the swarthy Max (Matt Barber). Amongst the noisy hustle and bustle, an elderly lady sits quietly at a table waiting for the train. She is Miss Froy (Juliet Mills), a children's governess, on her way home after six years with the same Austrian family. They no longer need her, as her charges have now grown up. Miss Froy befriends Lady Iris and tells her that she is fluent in many languages.....which makes her seem somewhat overqualified for a governess! Suddenly the onward journey is announced to continue, and in the rush for the train, Lady Iris is knocked flying by a porter carrying heavy luggage and is badly hurt. Miss Froy takes the injured girl under her wing as they board the train, and their friendship develops. At this point, the set ingeniously narrows down to the inside of the train carriages with its various sliding door compartments and the dining car. You could be forgiven for thinking you were on the Orient Express. You can certainly see how the play would have been very effective as film, with the sliding doors revealing the characters within and their stories, as lights go up and down on each compartment. Lady Iris falls asleep and when she wakes up the elderly Miss Froy is no where to be found and, what is more, no one seems to have seen her either, or will admit to it anyway. Lady Iris is left wondering whether she had imagined meeting her in the first place, as she is still concussed. Her search for Miss Froy forms the basis for the rest of the story and there is genuine suspense and a sense of danger for the rest of the evening. A long, loud gun battle takes place at one point. It is very noisy, which I enjoyed immensely, but if you are of a sensitive disposition, you may need to take your earplugs! The energetic cast work vigorously and are obviously having a ball playing this very entertaining "tongue-in-cheek" thriller. Eastenders' fans will recognise Lorna Fitzgerald from her role in the soap as Abi Branning; whilst Coronation Street's Dennis Tanner, aka actor Philip Lowrie, plays Eric who is travelling with his mistress. It is always great to see familiar actors, who we associate with a TV role, showing their metal on stage and all the actors here are excellent. However, it is the veteran and venerable actress, Juliet Mills, eldest daughter of Sir John Mills, whom most of the audience have come to see. There is also the added excitement that she is acting opposite her real-life husband, Maxwell Caulfield. Miss Mills does not disappoint. She has a twinkle in her eye and is obviously enjoying herself in the role of Miss Froy, whilst Mr Caulfield gives a great performance as the mysterious Dr Hartz. The spectacular set design uses every inch of the Palace Theatre stage, and looks visually very impressive. It effortlessly moves from the cavernous railway station to the intimacy of the train carriage in seconds. Designer Morgan Large has done a great job here, aided by very effective lighting by Charlie Morgan Large, which cleverly suggests movement as the train speeds onwards. The theatre stalls were full on Monday night and bookings for this spectacular all-star production are healthy for the rest of the week, so if you are a fan of the thriller genre, I strongly recommend you book your tickets now! Palace Theatre Westcliff, Evenings at 8pm, with matinees on Thursday and Sat at 2.30pm.